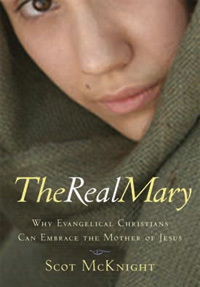 Scot McKnight accomplishes two good objectives with his latest book The Real Mary: Why Evangelical Christians Can Embrace the Mother of Jesus (Paraclete Press, 2006). First, as the subtitle suggests, Scot wants to take the jitters out of evangelicals who are jumpy about honoring Mary the Mother of Jesus. Some kind of anti-Catholic Protestant Reformation residue lingers on many of us and we find it hard to honor Mary because we might be mistaken for "worshiping" her. Oh, no! With a scholar's keen research, a pastor's concerned heart, and a writer's competent, engaging communication style, McKnight presents a down-to-earth, gospels-based Mary. Young Mary is a true, courageous human being surrendering to her part in the unfolding drama of God's story. Scot doesn't present a religious, stained-glass goddess, but a fiesty, gutsy, intelligent, deeply devoted woman who wrestles with the demands, responsibilities and heartaches of being the Mother of God-in-flesh. Second, Scot wants the Catholic readers of the book to assess where they may have gone too far in honoring Mary, not so much in practice as in theological pronouncements. This is done, once again, in plain, understandable language. Scot is fair because he shows that some Protestants have misunderstood some basic tenets of what Catholics believe about Mary. I was surprised by how many Protestant "greats" in church history believed in the perpetual virginity of Mary. On the more controversial theological issues, Scot offers in-depth chapters toward the end of the book. Scot "unpacks" Mary's Magnificat showing the deeply held convictions Mary had regarding God's redemptive work in the world. Scot converses about how much Mary influenced Jesus' own vision and mission of his ministry. The question whether or not Mary had other children is raised and dealt with in an irenic manner. Remember the scene in Mel Gibson's The Passion of the Christ when Jesus falls under the weight of the cross and Mary, his mother, has a flash-back to when Jesus was a little boy and fell while running? Remember how those scenes made Jesus seem more real, more truly human? The Real Mary does the same thing. Both Jesus and Mary are incarnate--flesh and blood human beings in a real mother and son relationship. After reading the book, I felt no urge to "worship" Mary, but I felt deeply challenged by her life of courage and devotion. This book would be a very fitting Christmas gift this season. Thanks, Scot, for another great book. Amen, John. A nice, fresh review and perspective from you! I can almost see her. And like you say, the book really points us to her son. *The Real Mary* is an informative, delightful book. Thanks, again, for stopping by. I haven't read the book yet (shame on me) but Scot's depiction of her in Creed was mind blowing to me. Great, now I have to buy this book! "Honey, can I have an advancement on my allowance...?"